What Are the Ingredients in the Tetanus Shot? Tetanus, a disease caused by the toxin, tetanospasmin, kills one out of every 10 people, according to "Mosby’s Drug Consult." Clostridium tetani bacteria exist in soil as spores and can enter the body via puncture wounds, such as those sustained by stepping on nails. Without oxygen, the spores become active and release their toxin. This causes tetanus, also known as lock jaw. Tetanus shots can prevent the disease, administered alone via injection or combined with other vaccines such as diphtheria and pertussis. The tetanus shots contain both medicinal and non-medicinal ingredients. 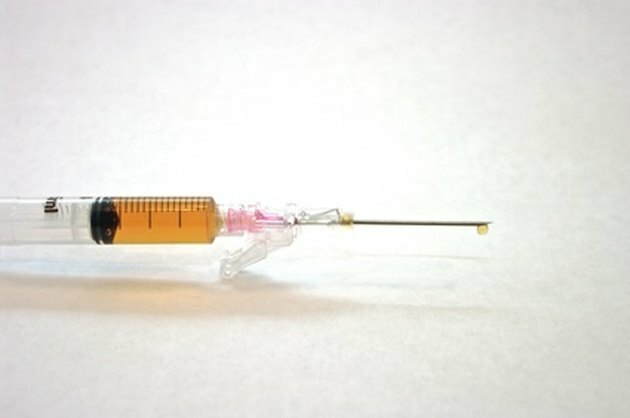 According to Drugs.com, tetanus vaccines contain inactivated tetanus toxins or toxoids from the bacteria, Clostridium tetani. Vaccines are supposed to work by introducing the immune system to harmless antigens from the disease organism, which stimulate the immune system to produce anti-bodies. Antibodies quickly and effectively fight the virulent disease when attacked. Certain levels of antibodies in the blood are usually needed to mount an immune response, which is why booster shots are recommended by doctors. Specifically, tetanus boosters are recommended every 10 years after the age of 7, according to "Mosby’s." Formaldehyde, a common ingredient in many vaccines including tetanus, is used as a liquid preservative. Formaldehyde is also on federal regulatory lists of compounds that are hazardous to human health; the amount in a tetanus shot, however, is small enough to be considered safe. Thimerosal is an antiseptic and antifungal agent containing mercury, a common ingredient in adult vaccines, notes "Mosby’s." In the U.S. and Europe, thimerosal is no longer used as a preservative in childhood vaccines because of the concerns of mercury poisoning, although it continues to be a component of tetanus shots. Tetanus vaccines contain aluminum, which is classified as an adjuvant. Adjuvants help stimulate the immunity response against the vaccine ingredients, making the vaccine more effective, as noted by the National Network for Immunization Information. Although aluminum phosphate is suspected as being harmful to the cardiovascular and respiratory systems by the Environmental Defense Fund, it is present in tetanus shots in what is considered safe amounts. Dibasic sodium phosphate is another ingredient in the tetanus vaccine. It helps create an acidic environment in the blood which boosts the effectiveness of the vaccine, according to "Mosby’s." Sodium phosphate monobasic is similar to its dibasic form, although it is used in vaccines such as tetanus more for its fungicidal properties. Sodium chloride, also known as common table salt, is also present in the tetanus vaccine. Sodium chloride acts as a preservative and antiseptic in liquid solutions. The final ingredient in tetanus shots is distilled water, which accounts for most of the vaccine’s volume. Water can also be considered a mixing agent or solvent in solutions.